After the owl mittens were done, I was excited to start a new project. It involved bigger needles and bulky yarn. Yay for speedy knitting, I thought. Hmmh, not so. Have you ever tried knitting with cotton yarn? I thougt when I was making the small entrelac patch that the yarn was absolutely fine. 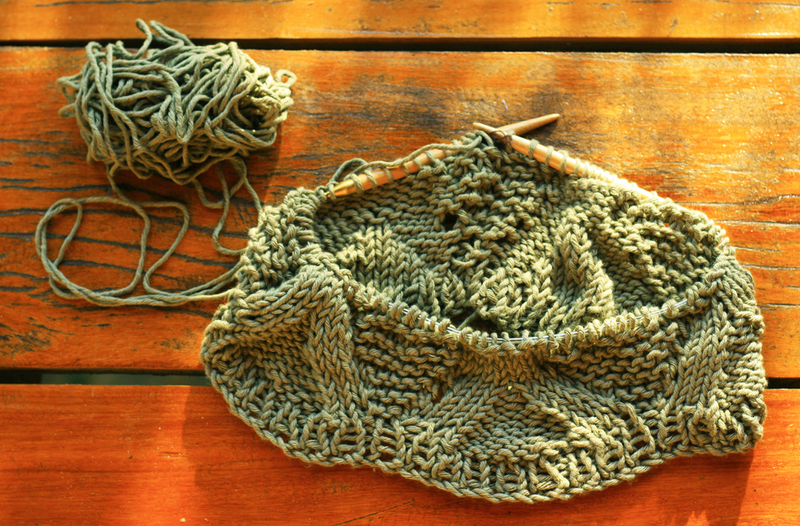 But when casting on for the state street cowl I noticed that the yarn had a mind of its own. It. Just. Wouldn't. Budge. I mean, no give at all. Zero. Zilch. When knitting with small needles, I don't think that's a problem, but when knitting with such thick ones (9 and 10 mm) with a thin cable in between you really have your work cut out for you. As the yarn is so rigid, you have to constantly pull stitches on the left needle and push them off the right one, and I don't mean gently. After the first night of knitting my thumb was really sore from pulling the stitches from the cable onto the thick needle. Pheew! The finished knit surface seems ok, though, so I think the cowl will be wearable even though it will be an effort to finish. The other problem were the yarn overs that were marked in the pattern. As you can't really knit tight with a yarn like this (or at least I can't), the holes the yarn overs left were HUGE. So, after doing a few, I decided to knit the rest of them from the back loop and close the holes that way. Maybe the big holes would have looked nice in the end, but now they just look like mistakes... Oh well, it's not like I'm planning of selling this masterpiece to anyone, so as a festival cowl I think it will serve its purpose just fine.